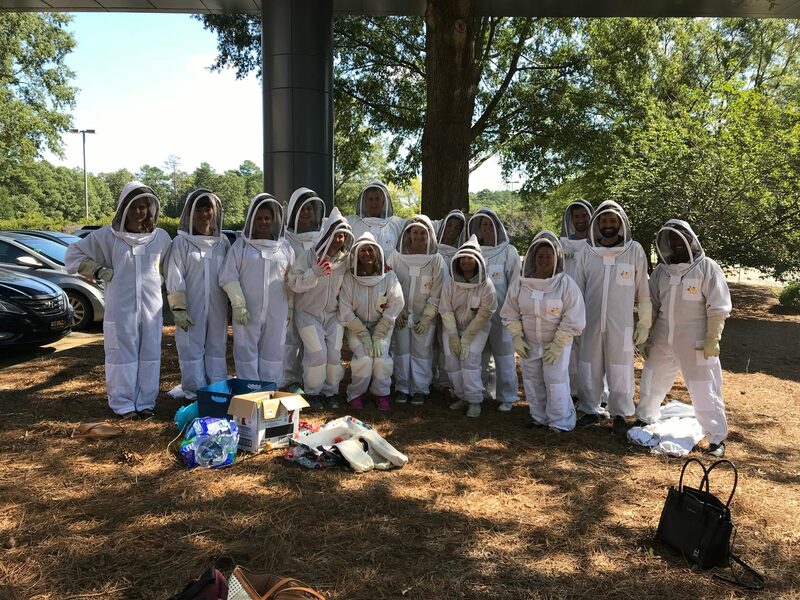 The RTF staff suited up for our hive tour. Once a month, the Research Triangle Foundation staff meets at our headquarters to hear about what other teams are up to. 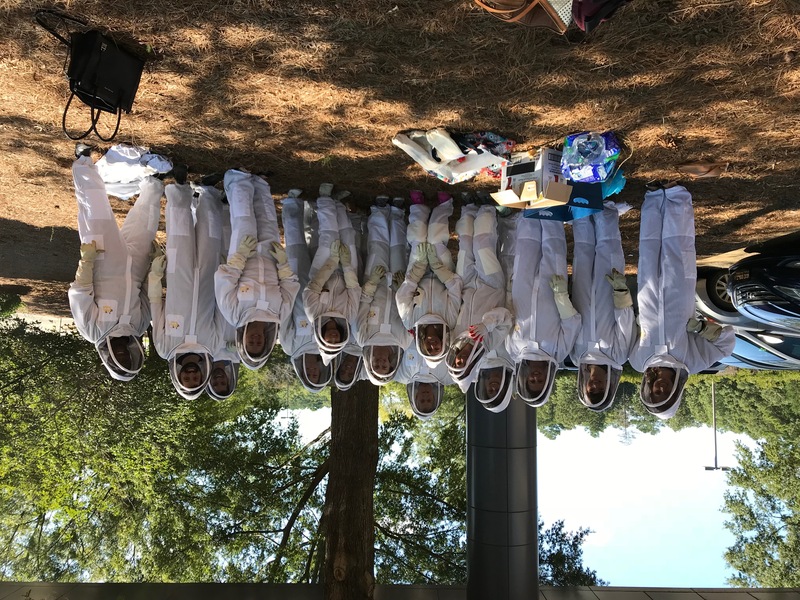 For this month’s meeting, we decided to shake things up by getting out of the conference room and into our Bee Downtown honeybee hives at The Frontier! Our hives, located just outside Frontier 600, are some of the most productive in terms of honey in the Triangle area. About 60,000 bees spread across three hive boxes make their home just outside Devada’s offices. 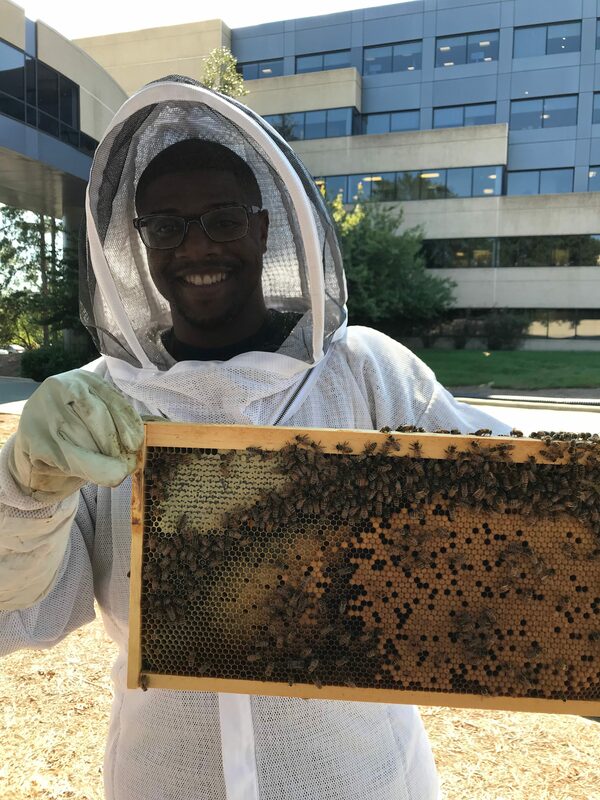 Two members of the Bee Downtown team, Lead Beekeeper Ben Dictus and Account Manager Scottie McLeod, spent the afternoon teaching us the components of a beehive, what to look for when examining the hives, and how to behave around bees. We learned that a tiny puff of smoke from cedar chips causes a “feeding response” in bees that sends them into the hive (and away from your hands) to chow down on some honey. This is a response to the threat of fire—in the event the hive is destroyed, they want to load up on energy for their journey to find a new home. Our IT Director, Kevin Patterson, holds a frame full of honeybees and honey. We also learned each hive box holds several frames, which are rectangular panels the bees use to lay eggs and make honey. Each frame holds 10 or more pounds of honey! To remove a frame, we used what is called a hive tool, a flat piece of metal designed to pop the frames out without damaging the frames or harming the bees. Most of or team members took their turn removing and examining a frame, something beekeepers get to experience every day as they check on the health and happiness of the bees. In addition to providing these pollinators with a home within RTP’s 7,000 acres, we are able to repurpose the honey into some local projects. Last year, Bee Downtown helped us harvest more than 100 pounds of honey from our Frontier hives. Next, we sent it over to Neuse River Brewing, where it was transformed into a delicious witbier called Worker Bee Wit. It doesn’t get more local and sustainable than that. Keep an eye out for news on our next collaboration, and if you think a bee hive tour sounds like fun for your next team building activity, check out Bee Downtown’s website.